Pick up from your hotel in the morning to the Thich Quang Duc monument, located in Nguyen Dinh Chieu Street where this Buddhist monk whose self-immolation on 11th June 1963 precipitated the end of Diem’s reign. Moreover, it was initiating the fall of the Saigon regime. 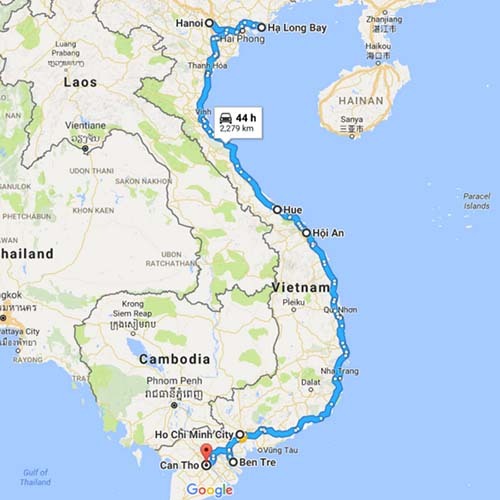 Our tour continues to the northwest of Ho Chi Minh City. Located 37 miles (60km) from Ho Chi Minh City, Cu Chi tunnels is now considered a heroic district for its role during the American war in Vietnam. The tunnel complex was initially started in 1948 to protect the Viet Cong guerrillas from the French air and ground sweeps. The tunnels also served as communication routes, storage facilities for food and weapon caches as well as hospitals and living quarters for guerrilla fighters throughout the American war. A visit to the underground villages will provide a better understanding of the Cu Chi tunnels’ history, the hardship of life in the tunnels and the Vietnamese resilience during combat. In the late morning return to Ho Chi Minh city. For lunch, we recommend, Broken rice (Com tam) – one of the best Vietnamese eateries at Com Tam Ba Ghien or National noodles (Pho). Continue your tour to the Independence Palace and the War remnants museum which not only primarily contains exhibits relating to the Vietnam War, but also includes many exhibits relating to the first Indochina War involving the French colonialists. At the end of the afternoon head back to your hotel.